Heat oven to 350°F. 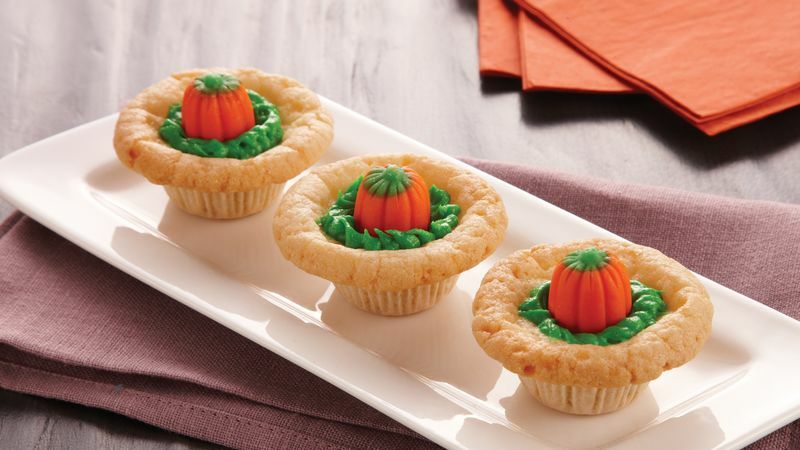 Place mini paper baking cup in each of 24 mini muffin cups. Press 1 cookie dough round in each cup, pressing in bottom and up side to form shell. Place 1 peanut butter cup candy in center of each dough-lined cup. Bake 18 to 20 minutes or until golden brown (crusts will be puffy). Cool 5 minutes; remove from pans to cooling racks. Cool completely, about 15 minutes. Pipe green icing in center of each cookie cup to look like grass. Place 1 candy pumpkin in center of grass.